Lewis, born in 1380, was Geoffrey’s second son, the first being Thomas, born 1367, who was a great man in England by the early fifteenth century. No one knows what happened to Lewis after he grew up, though some records mention him in connection with Thomas. Geoffrey likely met Philippa at court. He’d been sent to work as a page at the home of the king’s son, Lionel of Antwerp, and worked his way up in court, serving as a soldier, diplomat, Controller of the Customs of the Port of London, member of parliament for Kent and much else. When Lewis was ten, Geoffrey gave him an astrolabe and a set of instructions on how to use it that Geoffrey had himself translated into English, since Lewis was too young to know much Latin. 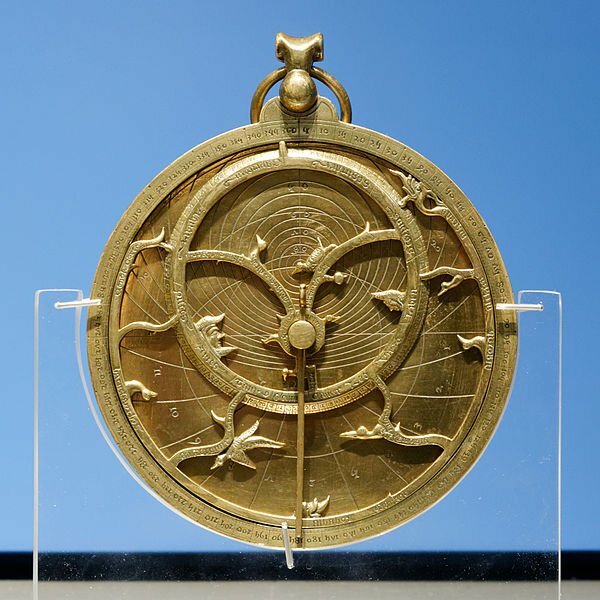 The book was by the eighth-century Arab astronomer Messahala, and its Latin version was called Compositio et Operatio Astrolabii (The Structure and Use of Astrolabes). 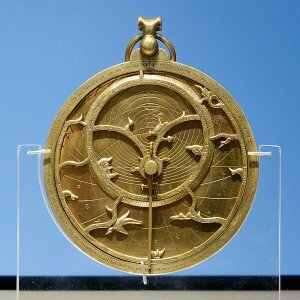 Astrolabes were invented by the Greeks in the second century BC and developed by the Byzantines and Arabs. They use triangulation to measure the heights of planets and stars from the horizontal. Knowing your latitude, you can tell the time from them (at night); knowing the time, you can calculate your latitude. They were especially useful to mariners who on the open ocean are out of sight of any landmarks. For example, you could hold your course (your latitude) across the Atlantic and hit Cuba, Iceland, Greenland, etc. If you got blown south, the North Star, if that’s what you were sighting on, was closer to the horizon; north and it was further up. We know from Geoffrey’s poetry that Geoffrey himself was interested in such things. The Canterbury Tales are full of medical and astronomical references that are up to date for their time, and Geoffrey often mentions his sources. He was a great reader. Geoffrey goes on to explain that he has translated the treatise into English, using “naked” (simple) words and basic grammar, “for you don’t know much Latin, my little son.” He actually translates only what a kid could understand, sticking to two parts of the Compositio, the description of the instrument itself and a set of simple problems that can be solved using it. And so it goes. It’s the first scientific or technological report, the first set of instructions for a scientific instrument, in English.